The first two months of the box office season have been Kansas. Moviegoers are now ready to head to Oz. Yes, the unending onslaught of low-budget horror films is finally interrupted by a big-budget Walt Disney film that will take viewers back to the beloved land of Oz. The Wizard of Oz, released in 1939, has been a staple of childhood movie-watching for generations. Parents share their love for the film with their children, which makes this the perfect franchise for Disney to take over. They’ve spared no expense in re-creating the world of Oz in an all-new story, as The New York Times reports that Oz the Great and Powerful represents a $325 million investment for the studio. Fortunately, this is not John Carter all over again…we don’t think. 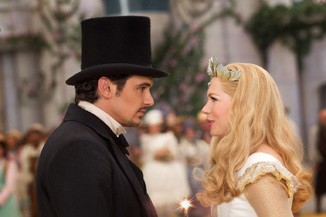 The most natural comparison for Oz the Great and Powerful is 2010’s Alice in Wonderland, which Disney also released during the same weekend in March. Only three years ago, the Tim Burton film became a shocking global sensation. Thanks to the international appeal of Johnny Depp, it became only the fifth film to gross $1 billion worldwide. Released only three months after Avatar got audiences excited about the possibilities 3D could offer, Alice in Wonderland seemed like a film that offered the same sort of exciting visual effects. Disney took advantage of the trend and the film rode the wave to a $116.1 million opening weekend. Now, Disney is looking to take the Alice in Wonderland model and expand it to a project that can become a franchise. Who better to put at the center of its development than Sam Raimi, who similarly guided a big-time series to massive success during the 2000s. The Spider-Man trilogy he directed earned more than $2.5 billion worldwide and was itself known for showy visuals and exciting action. For Raimi’s journey to Oz, rather than spend big bucks on a bankable lead like Depp, he went with a combination of recognizable and talented performers. James Franco (who was one of the three key players in the Spider-Man films) was coming off his Academy Award nomination for 127 Hours, while Rachel Weisz is a recent Oscar winner and Michelle Williams is a three-time nominee. Mila Kunis recently starred in the surprise blockbuster Ted. All of them together probably didn’t cost as much as Depp, yet they provide credibility for a project steeped in fantasy.